When children are ready to learn to read and write, the first step it teaching them the letter sounds. Talking Fingers Inc. has released an online phonics program called Talking Shapes: A Supplemental Curriculum for Early Literacy to help parents do just that. The program follows a series of seven stories of two sisters and how they created the alphabet. Each story adds six new speech sounds (phonemes), eventually resulting in all 40 (in the English language) phonemes being taught. 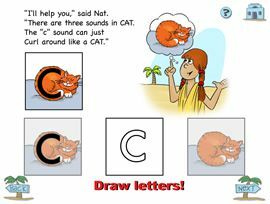 The stories are accompanied by games that help children sound-out and build three-letter word and draw the letters as they play. There is also a reading game that helps the children decode and recognize words they have spelled. How did Talking Shapes come about? Created by noted neuropsychologhist, Dr. Jeannine Herron, Talking Shapes introduces and reinforces letters (and their sounds) in ways that engage both the right and left sides of the brain. In the long run, these techniques build pathways in the left brain that will be needed for reading. Neat, huh? Who would benefit from using the online phonics program? We live in a digital age; there is no doubt about it. You can’t walk the aisle of a market without seeing children from nine months (!) to adults staring at a device. With such an overwhelming array of products available on our phones, tablets, and computers, I am thankful for companies like Talking Fingers who create quality programs for our children. While this online phonics program is not a stand alone curriculum, it is definitely a good supplement or enrichment piece for young children.